I want to let you know about a charity event that I will be participating in this December. It’s called the Cure GM1 Charity Concert. 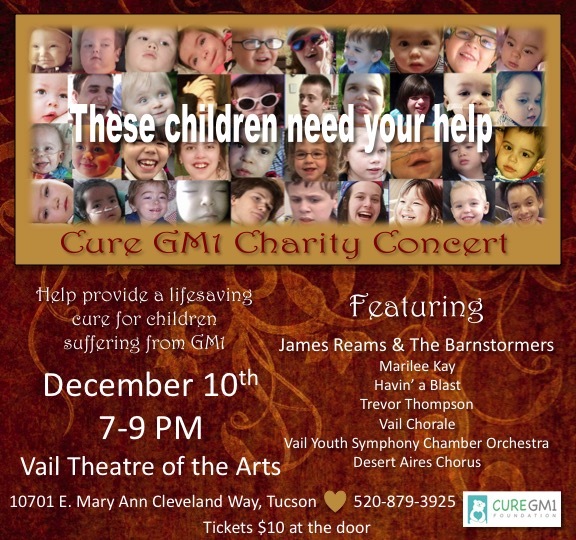 The folks that have organized this event, and some of those participating in it, have young children that have been diagnosed with a rare, and fatal, disease called GM1. Those living with GM1 must watch as their children lose the ability to walk, stand, speak, even swallow. Their vibrant lives are cut drastically short. But there is good news. A cure may be on the horizon thanks to promising research from Auburn and UMass Medical Schools. All that’s lacking to gain FDA approval is the required testing. I know that you can’t all drive down to Tucson, AZ and support this fundraising effort, but you can donate online. Please consider the Cure GM1 Foundation as you plan your holiday giving. Every little bit helps move them closer to possibly having a cure by 2017. Thank you and God bless.